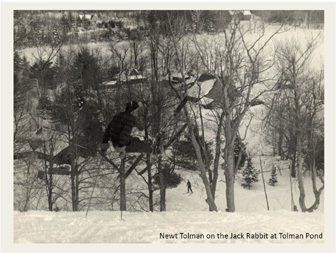 Many thanks to Karen Tolman who wrote the following history of this ski area, and sent us extensive historic and recent photos of the ski area. All pictures are courtesy of her, please click on each for the larger version. 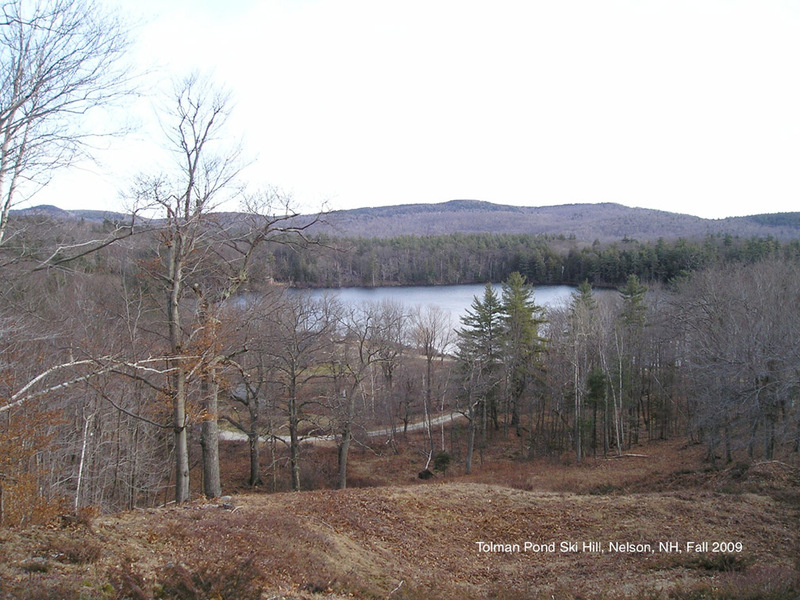 I sit here, looking out over this little 40-acre gem of water, and wonder what it was like in the early days of skiing when small ski hills were sprouting up all over the New England landscape. 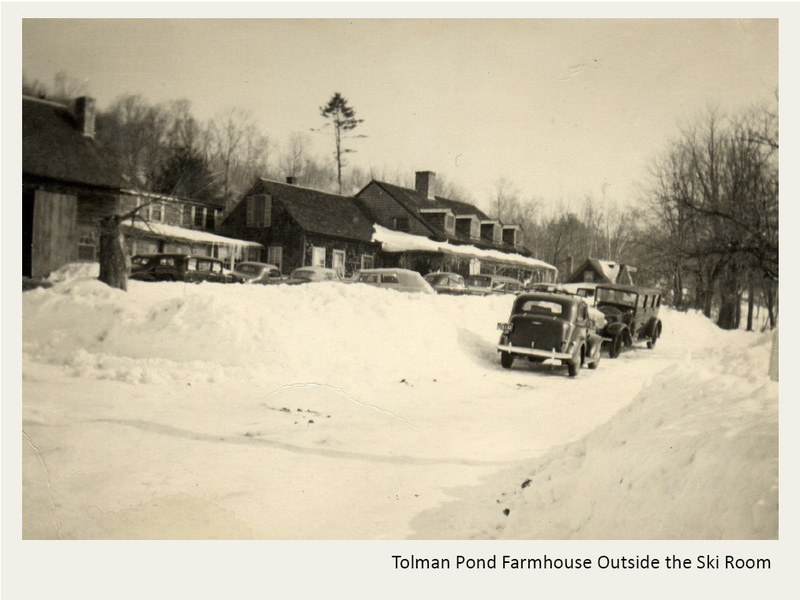 Such was the case at Tolman Pond where brothers Newt and Fran Tolman helped their folks Ma (Sadie) and Pop (Wayland) run a guesthouse in the old family Farmhouse. They also rented out ten summer cabins, whose renters usually joined the others for meals in the Farmhouse. 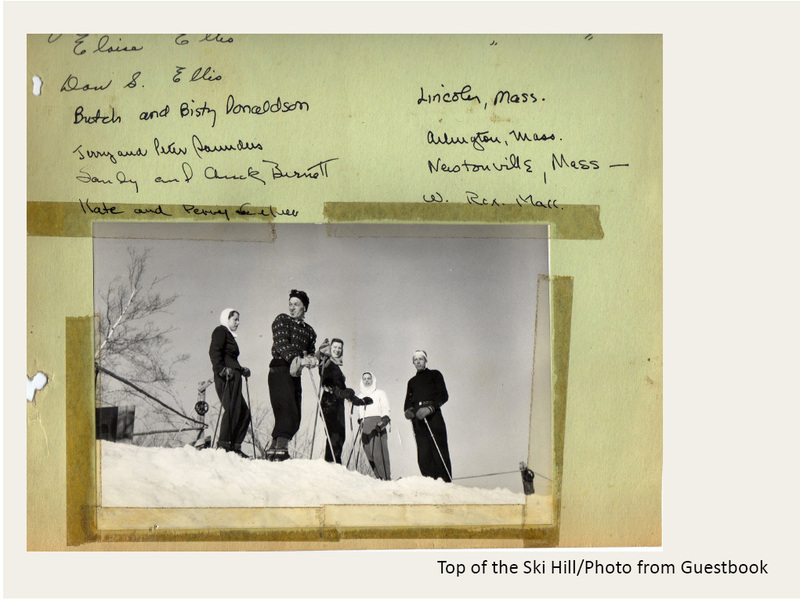 In order to make ends meet a little bit better, they expanded their winter business by adding something new - skiing. 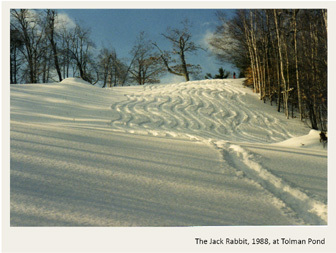 They not only cleared the Jack Rabbit in the 1920’s, but also extended the clearing out in all directions eventually encompassing several acres. They cleared trails up Hurd Hill behind the Farmhouse, and anywhere else they deemed feasible for a ski run. They used the field, where Ted Lenk and Susan Weaver now pasture their sheep, for lessons and practice. This field is still called the Practice Slope. 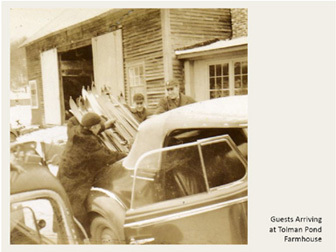 Newt set up a shop in the back of the barn at the Farmhouse to make wooden skis. 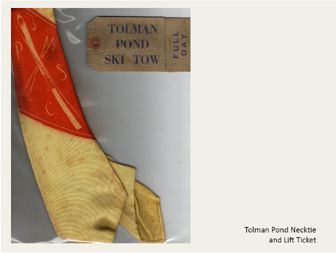 He not only sold his skis but also rented them out. During the height of the season, Uncle Bill French helped to manage the shop where he fitted and waxed the rental skis for the guests. These were also the days when you had to climb to get to the top of the hill, so Newt recommended wrapping sealskins around his handcrafted skis to create some traction while climbing. 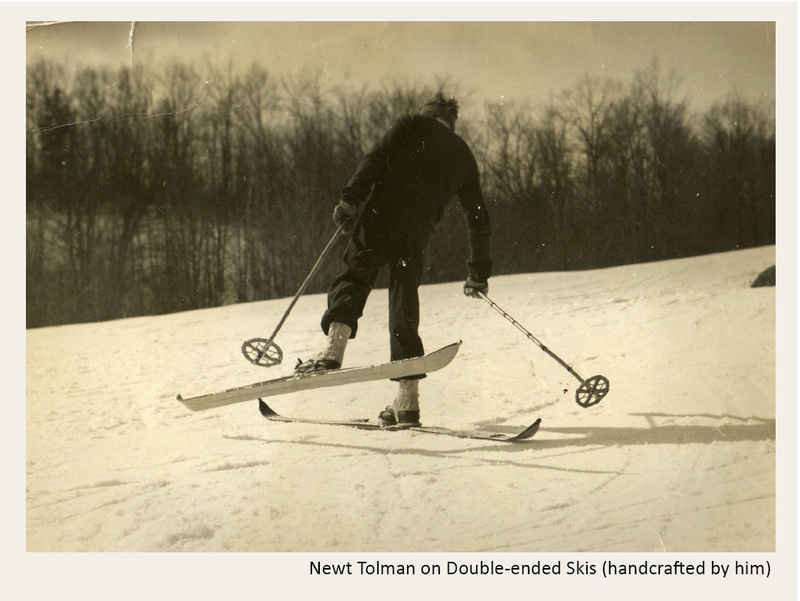 His ski-making venture soon evolved into making double-ended skis. He and his wife then offered lessons in how to use these for something Newt called "figure skiing". 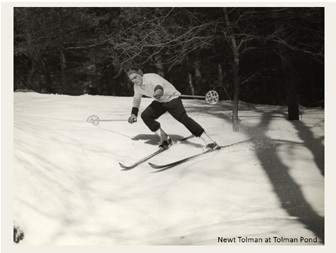 In fact, Newt later spent some time in Austria studying established skiing techniques, but came home more dedicated than ever to figure skiing. 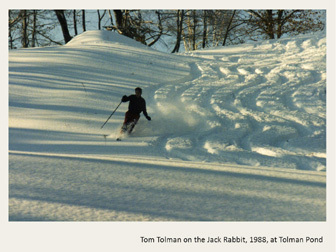 During this time, he also claims to have invented the use of metal edges, a strip of metal that he tacked onto the edges of the skis to make turning easier while skiing down the hill. He then carved a couple of "steps" into the bottoms of his wooden skis to aid in climbing. 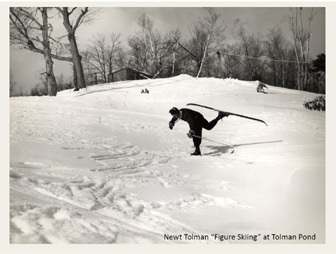 In a February 1957 article in the Atlantic Monthly, "Schussing a Few Decades", Newt wrote that: "among my own modest contributions were metal edges made out of bronze clock springs, a patented ski with a stepped bottom, and a technique known as "figure skiing." 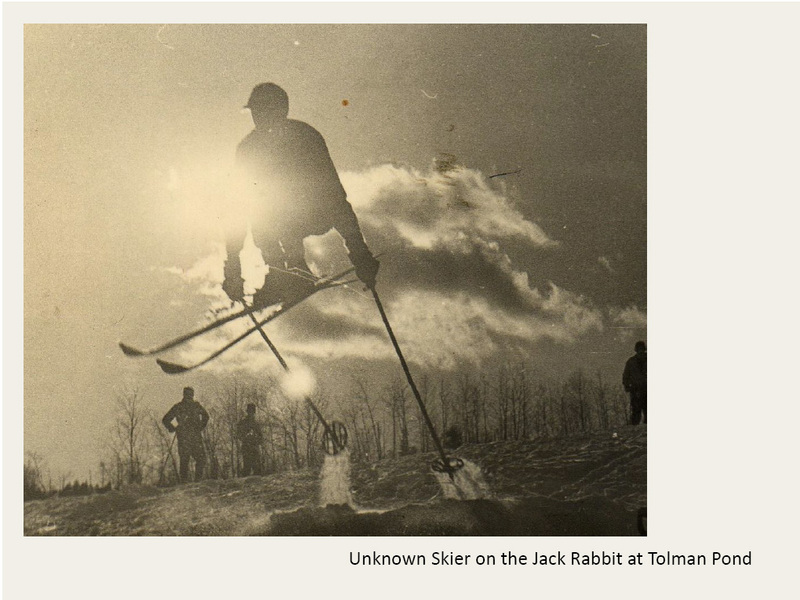 Using eight-foot double-ended skis, it enabled the skier to approximate somewhat loosely, much of the repertoire of Sonja Henie." Today, there are relics of Newt’s inventions tucked away in the hayloft at the Farmhouse gathering dust - double-ended skis, metal edges, stepped bottoms. 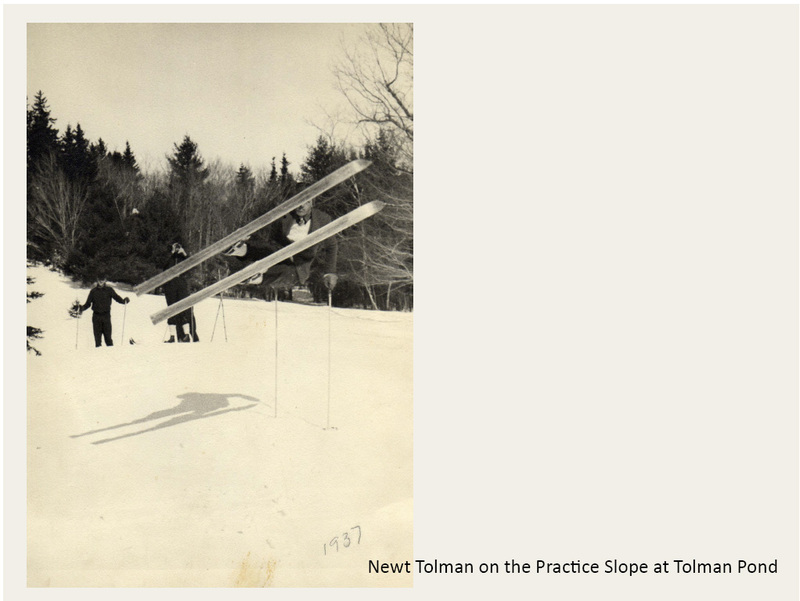 I think about these today, sitting up here on the hill - inventions far ahead of their time. 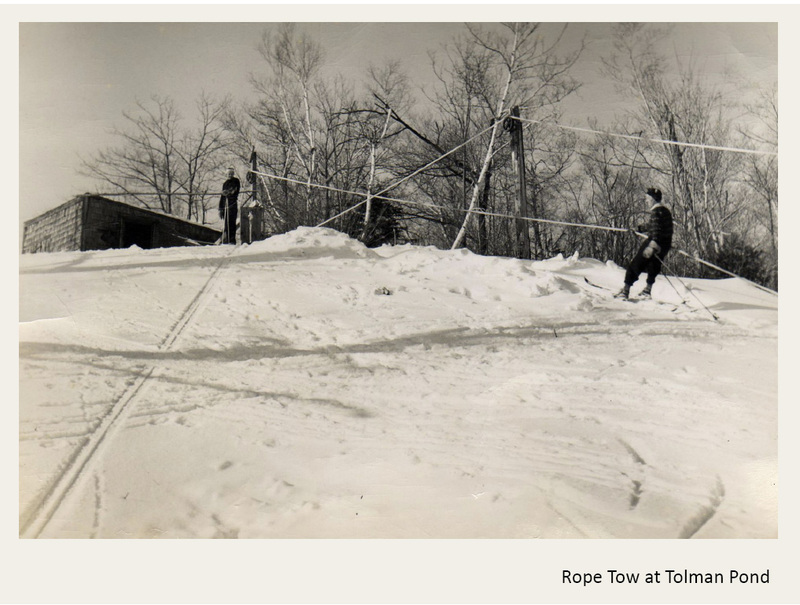 Becoming quite established as a destination for skiers, and with a growing clientele, many coming from the Boston area, it was time to turn up the volume and add a rope tow. From some rapidly expanding Vermont ski hill, they found a discarded 1931 Model A Ford engine, packaged with the necessary pulleys, shafts, belts and drive mechanisms. They were then gifted a well-worn, and no longer used, sisal rope from the drive that had powered the Cheshire Woolen Mills for many years in the neighboring town of Harrisville. Together with these acquisitions, they went to work. 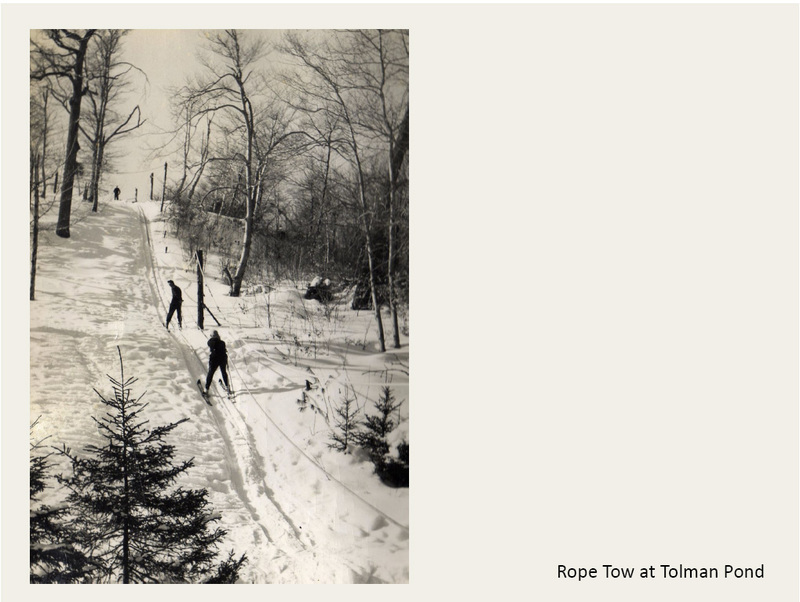 In the late 1930’s, having contracted with friend, neighbor and master mechanic, Walter Hutchins, to operate the tow, they opened for winter business with the addition of a new rope tow. Meanwhile, back at the Farmhouse, the chores loomed large. 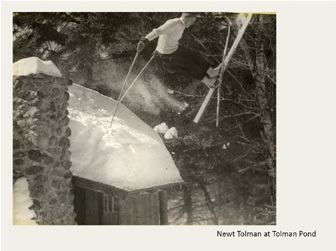 Ma Tolman, with the help of Mabel Curtis, housed and fed the skiing guests with reportedly fabulous home-cooked meals. 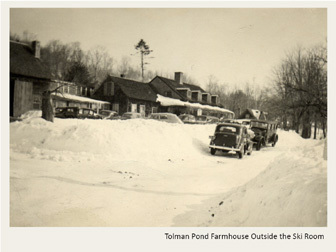 Pop, with the help of Newt and Fran, kept the wood shed filled, the fires stoked, the cows milked, the cream separated, the ice-cream bucket churning, the ice cut and stored for the ice-box, the eggs gathered, the plumbing fixed to accommodate its new-found demands, the root cellar and canned goods picked over, the chickens plucked, and the orders sorted from the Harrisville Store deliveries. 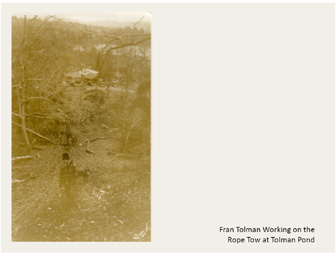 In the main part of the Farmhouse, where Tom Tolman and Larisa Belluscio now live, there were three double-bedrooms downstairs, two single-bedrooms upstairs, as well as the Rabbit Warren that could board a few more (heated by a hole through the floor which welcomed not only heat from below, but the rich smells from the kitchen), and the GHQ (aka General Headquarters), an unheated space that bunked many more. We’re told that as many as thirty skiers could be accommodated here at any given time - serviced by two rather marginally plumbed bathrooms. The living room and dining room became the after-ski and after-dinner gathering spot where music and stories and games were shared around the old upright Steinway piano and the center-chimney fireplace. 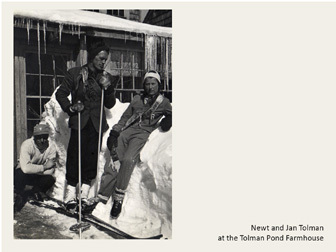 Newt and Fran were both skilled musicians and storytellers. The other end of the house, where the sheds had earlier been converted into living quarters, was home for Ma and Pop. 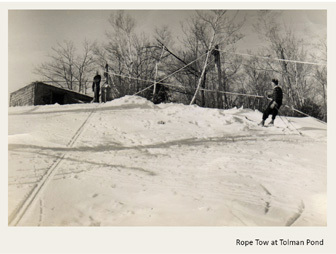 This area of the Farmhouse became known as the Ski Room, and is used today by our family and friends. This was where cold and wet clothing was shed and hung by the fireplace to dry. There was a ping-pong table in the large open living room, and Priscilla Walter recently reported that she remembers a swing hanging from the rafters. The cooking was done over here as well, accessing the dining room by a swinging door. And, Ma was often found resting in her adjoining sitting room that she shared with a few cats, a deck of cards, and gift boxes of nibbled and tasted chocolates. Someone was always visiting with her there. In fact, when there were overflow guests in the main part of the house, she and Pop would set up a bed in this sitting room and offer their own bedroom to the paying guests. Never knowing what tomorrow might bring, they stacked ‘em in anywhere they could while the going was good. Above the Ski Room, there was a seasonal (then unheated and unplumbed) apartment used by the help in the summertime, and minimally used in the wintertime by Robert Curtis, who helped out on the farm. Today, this apartment is home to Kirk Dale. The ski hill operated into the mid 1940’s, but by then interest had shifted to the larger and better-equipped ski areas in New England. 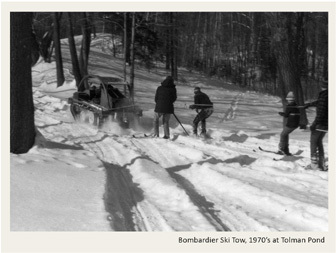 But a few years later, Fran's son Barry, who grew up skiing on the hill, tried to resurrect the tow. In the late 1940’s, at about 15 years old, he enlisted the help of friend and neighbor, Frank Upton. But the project was finally abandoned to the brambles, briars and ferns that eventually took over the hill. 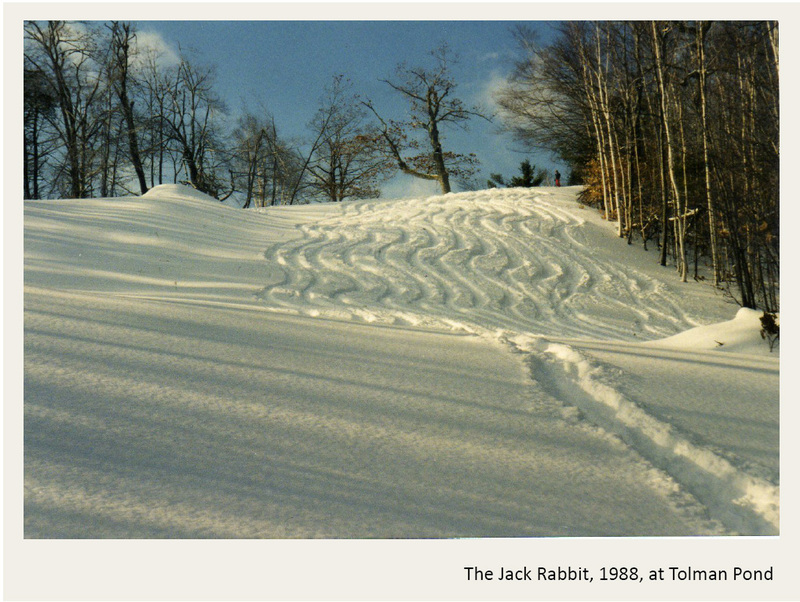 To haul kids up the Ski Hill to ski down the Jack Rabbit. In a truckload that dumped it all over the bejesus. They rebuilt this thing into a sight far from sorry. 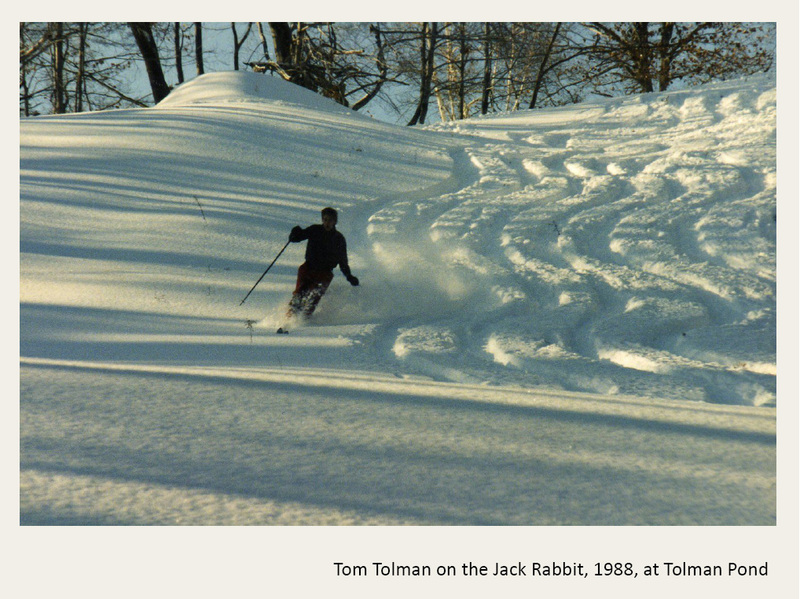 And glides through the snow with the grace of a cat. 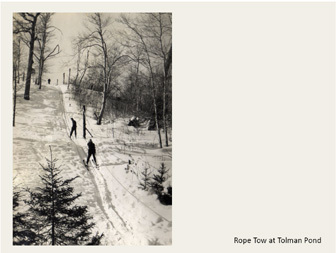 To the railings and rope tow with all their might. Nor daring to stop less they miss the next round. 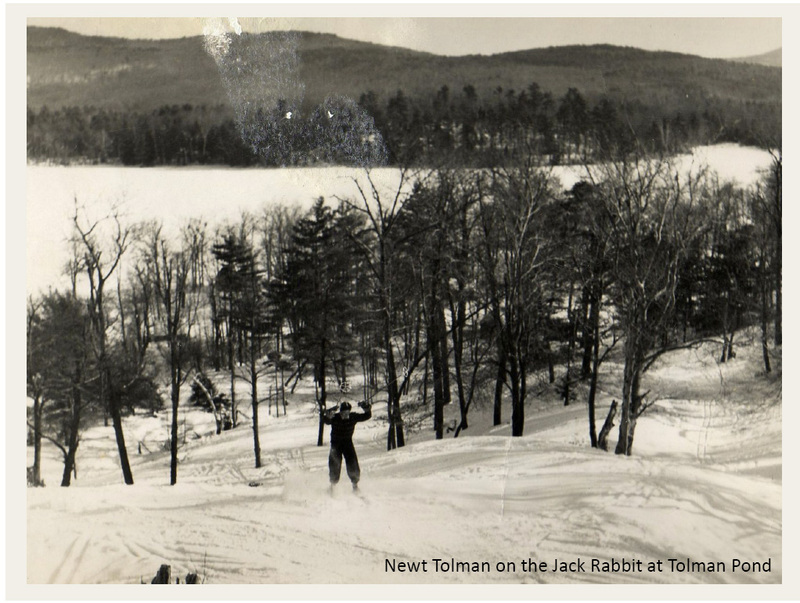 So then again, as in earlier days at Tolman Pond, many neighborhood kids grew up skiing on the Jack Rabbit. 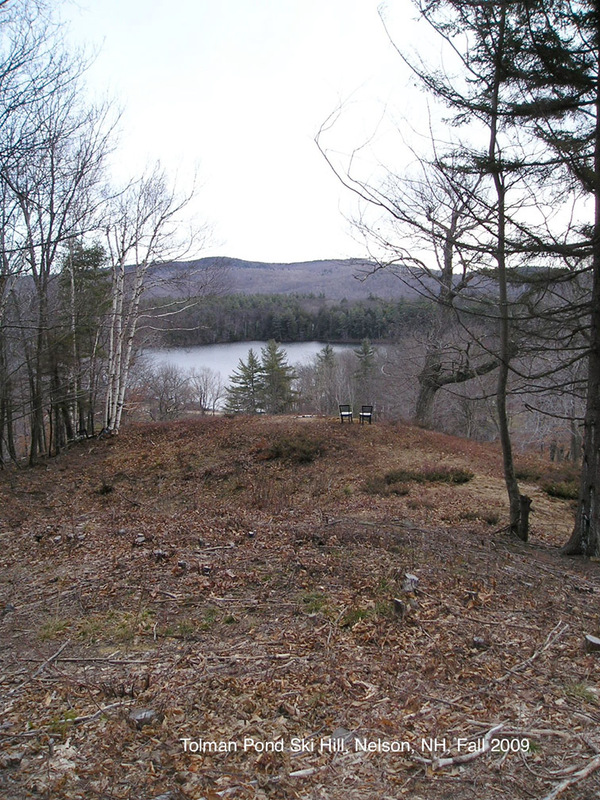 As I sit here up on the hill, I look out over where the tow once was and where the Bombardier once ran. Perhaps someday the “Bomber” will be put back to use. Meanwhile, it sits in the shed behind the Farmhouse needing some fixing. Then again, perhaps some other means of uphill transportation will come along first. But for today, the kids, even some in their 20’s and 70’s, don’t mind climbing the hill to get in a few runs after work and on the week-ends. 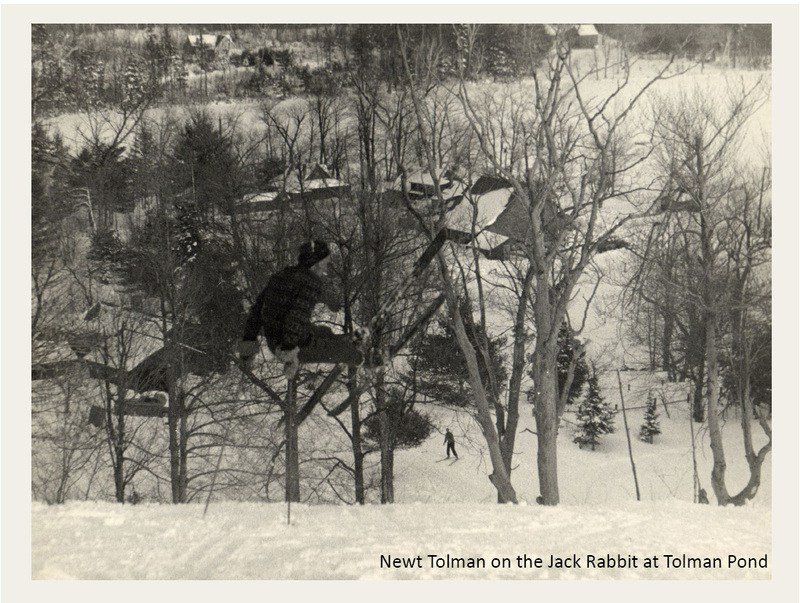 And, Barry, with his cousin Renn, his son Tom, his grandson Wayland, many other family members, friends, and even occasional cows, have kept the hill mowed, so that we can all look forward to a couple more runs down the Jack Rabbit - schussing into a few more decades. 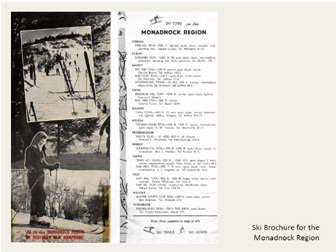 Tolman Pond was featured in this Monadnock Ski Brochure from the 1930's. 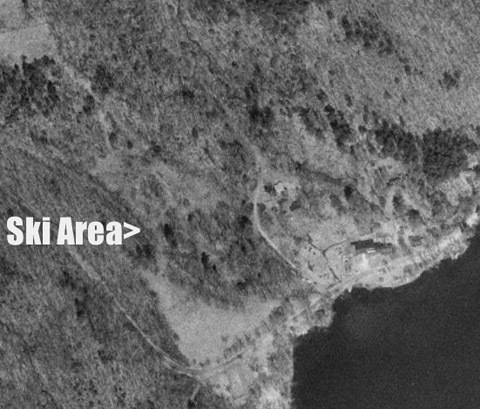 This 1998 view of the ski area shows some of the slopes. 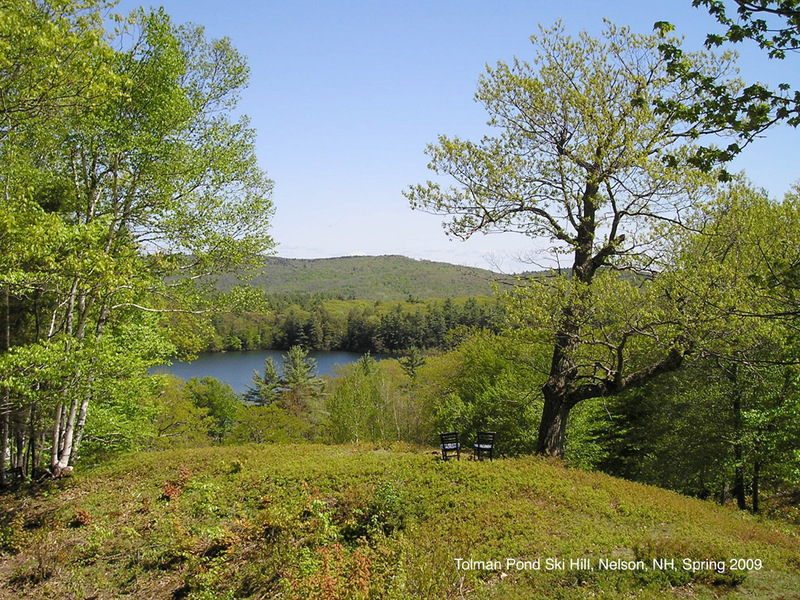 While a rope tow no longer operates, the trails are kept clear with a beautiful view of Tolman Pond. This is a classic New Hampshire view! This view shows a knoll with the pond taken in spring of 2009. 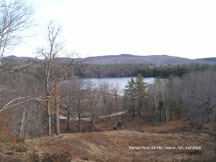 Another view of the ski slope and pond, spring 2009. 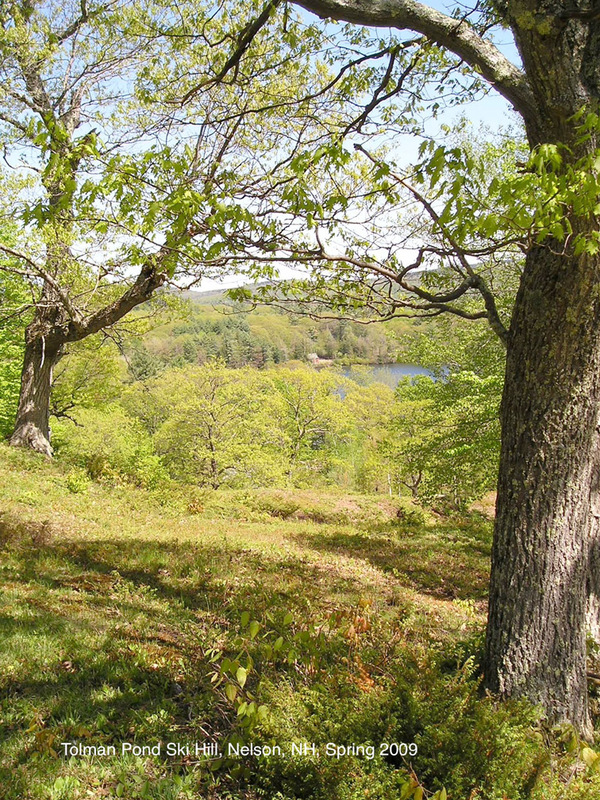 Fall 2009 View. Fall 2009 view, similar to above. 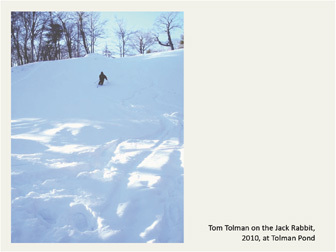 Tom Tolman on the Jack Rabbit, 2010, in deep powder snow. "We discussed other areas in the region. 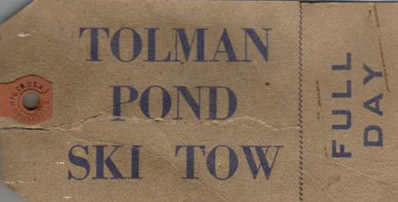 Tolman Pond, he is confident, was the first rope tow in the area. He said it began operating in 1934. (I checked in Newt Tolman's autobiography, North of Monadnock, but found only a vague reference to a tow. He did mention operating something of a bed and breakfast, and hosting skiers in the twenties.)" 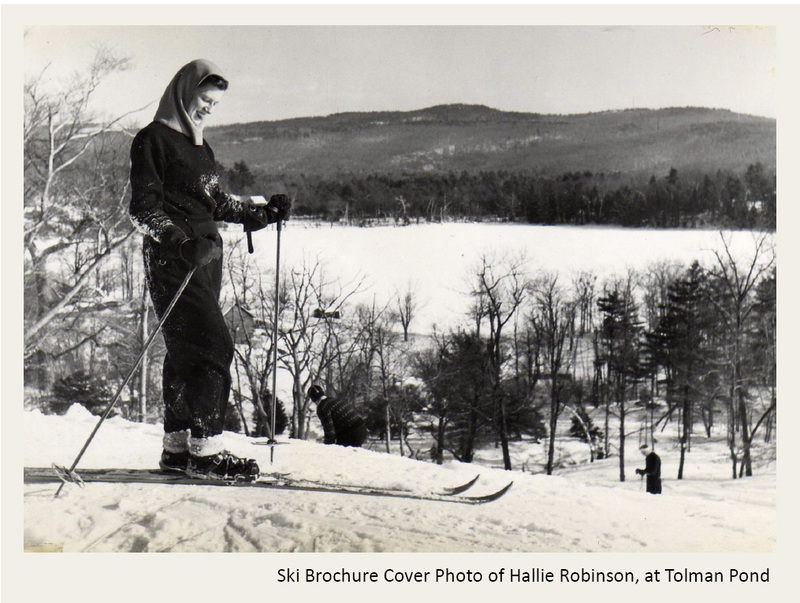 Steve Lindsey has more info: I live at Tolman Pond at the base of this venerable ski hill. 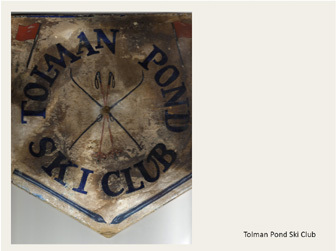 The farmhouse where visitors could stay contains artifacts from the days of skiing in the early 1930s including an impressive collection of wood skis, snowshoes, and a hand-painted trail sign. Relatives of Alpine skiing pioneer Newt Tolman still live in the farmhouse. 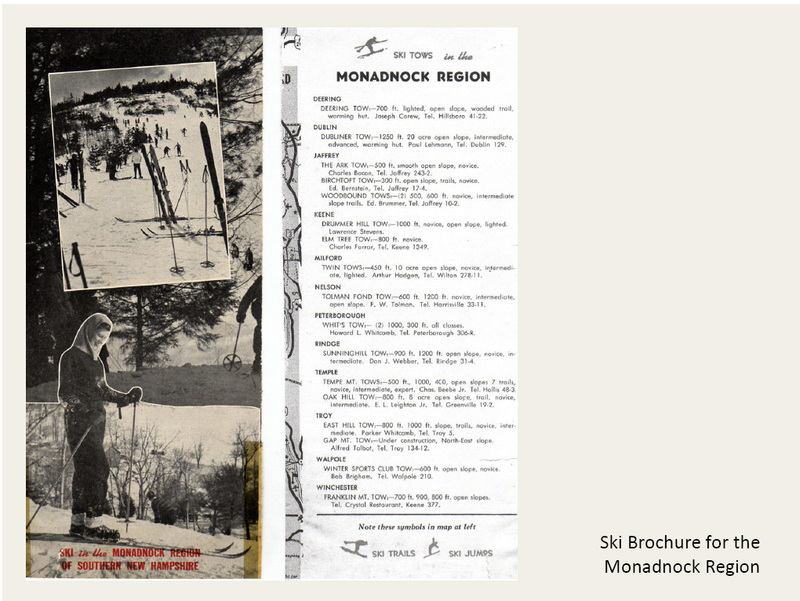 They have photos of skiers. 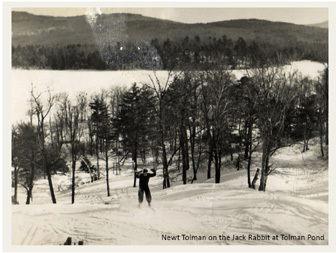 John Summers, one of the founders of the nearby Pinnacle Mountain Ski Hill in Roxbury believes the Tolman Pond site may be the second oldest, after Vermont's Suicide Six. 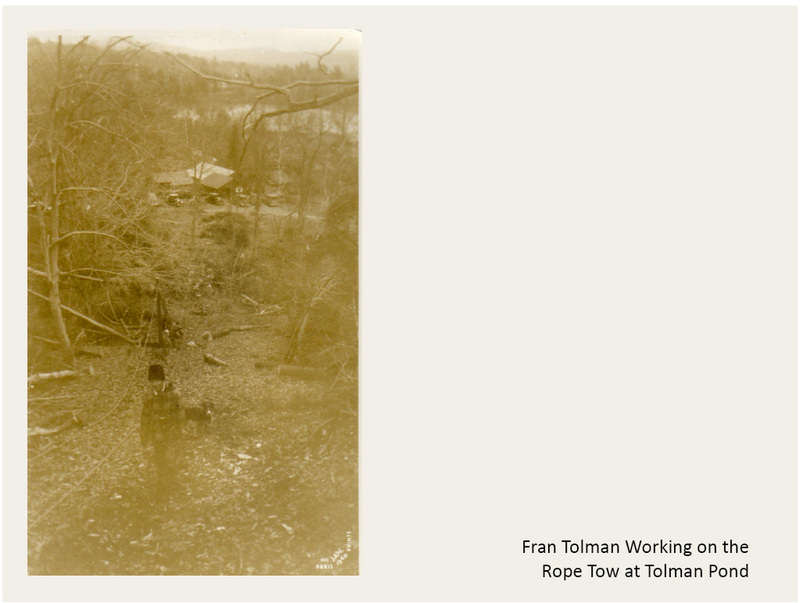 The logging skid which served as the base of Newt Tolman's rope tow engine still exists, rotting into the earth. The motor has been removed, but a flywheel, gears, axles, and brackets still are mounted on the skid. Does anybody else remember this one?